G E O R G E T T E C R I M S O N | As I settle into my thirties, I’ve noticed a significant shift in my shopping habits. 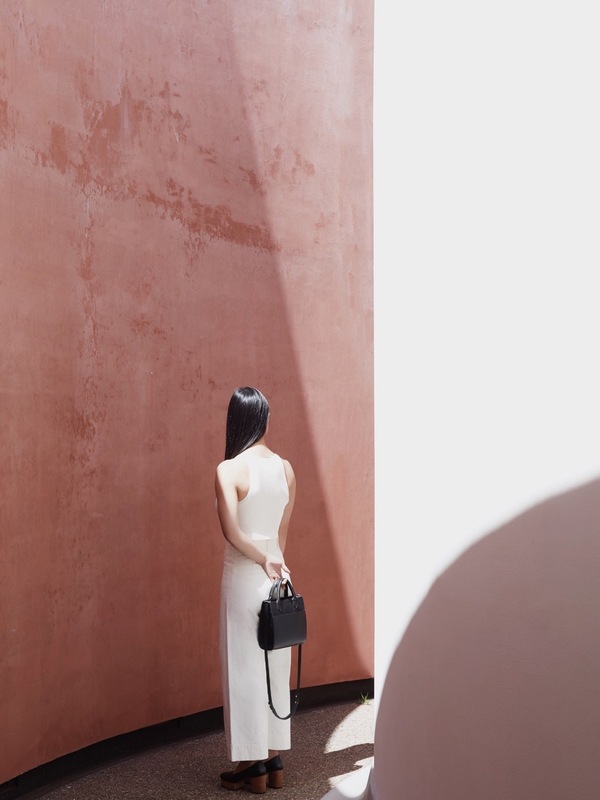 Unlike my 25-year old self, my interest for fast-fashion has waned, and I’m devoting more time into researching each object of desire, ensuring that it can personally serve a multi-functional, long-lasting purpose. Pausing to think about my consumption has impacted me in interesting ways… I’m incredibly aware of what and how much I own. I obsess about quality over quantity. I appreciate a brand’s collective story over their individual parts. One of the items I’ve been endlessly searching for lately is the perfect black handbag. Ubiquitous it seems, but it’s been impossible to find the one “go-to” bag that fits my high demands. Many a Google search came up empty-handed until I came across the Little Black Bag by Georgette Crimson. Its beautiful minimalism, noticeable quality, and inherent practicality spoke loudly to me. I knew this was “the one”. I recently teamed up with Georgette Crimson’s founder, Tina Reith, on her last day in San Francisco for a fun collaborative shoot highlighting her Little Black Bag in situ. I also chatted with Tina about her brand, her main influences, and her passion for timeless design. [ Jen Szeto ] Hello Tina! Tell us a little about yourself and Georgette Crimson? [ Tina Reith ] I grew up in East LA and have lived all over Los Angeles – Angeleno Heights in Echo Park, Koreatown, Downtown LA, and now, after a 4 year stint in San Francisco, I’m back again. This time, exploring Brookside and everything amazing south of Olympic! From a young age, I’ve always known I wanted to have my own business in fashion. So, I set out to learn as much as I could about the industry and everything behind-the-scenes and off-the-runway. From managing retail stores, running factories, and managing brands to leading large-scale product development and production management, I’ve built a pretty holistic view of the product lifecycle all the way from concept to consumer. I’ve seen so many great visions falter because of a lack of respect for process and reality – I know my brand needed to do it differently. I launched Georgette Crimson in 2014, with just 4 pieces, while I was still working a full time job. I was experimenting with concepts and wanted to keep things small, so they were easily manageable. In many ways, because most of the work I put into Georgette was in my off-hours, it has an inherent playfulness to it. You could take things seriously, but never too seriously. Ultimately Georgette Crimson is a world built on a simple belief that the pieces we wear should channel the whimsy of our spirits, the passions of our hearts, and the unconventional wit we rely on. For me, style is about a strong, infallible point of view. The broad strokes need to be right - of course, but it’s the tiniest details, that ultimately draw us in, tell us a story, affect our mood and the people we meet each and every day. Most importantly, I care about getting amazing, well made, affordable pieces to women on the timeline they live on, realigning product launches with the real season. Georgette pieces are designed to be timeless staples that fit into your every day, but are anything but basic. [ JS ] How did you come up with the name 'Georgette Crimson'? [ TR ] My personal name, Tina, sounded a little too 1980s and my last name, Reith, was always being mispronounced, so a namesake label was out of the question. I developed a character instead, because I wanted my line to channel a certain personality, one that’s witty, feminine, and playful (with a name that could easily be pronounced). Georgette is both a name that I’ve always loved and a fabric that is light and playful. Crimson is both a color and the later part of the name from a progressive rock band, called King Crimson. I found it to be a symbol for love - it’s passionate, yet brooding. And, to be honest, kind of nerdy – like me. There’s a nice tension between the two names, it’s dynamic. [ JS ] You have a really playful, other-era influence to your designs. Who or what have been your biggest inspirations so far? [ TR ] Music and film have always played a dominant role when it comes to inspiration. Lately, I’ve been listening to the DMA’s on repeat. I also love the playful silliness of Jacques Tati films. My music and film taste is very eclectic, but I find my passion in those strange and unexpected intersections. Art is another key player. Geometric shapes with stand out pops of color always get to me. Rebekah Goldstein is a favorite artist of mine that paints these huge works of art, literally, with these very attributes. Style-wise, Francoise Hardy and Anna Karina have always been my go-to muses and are just timeless. [ JS ] Tell us about the Little Black Bag - how did you come up with the design? Why is it such an essential part of your collection? [ TR ] When living in San Francisco, I took the bus, the ferry, the BART, and rode my bike. When designing, I thought about all of the things I wanted in a bag as a commuter. I didn’t want the design to get in my way when reaching for something from inside my bag. It was important for this bag to be something that a woman could carry everyday – and be her go to bag so to speak, it had to be utilitarian in function, yet clean enough in design to pair with just about any outfit. When it came to selecting a leather, I was drawn to this specific quality because it has a consistent pebble grain and ages beautifully. The aspect that it’s not delicate was another plus, because I’ve accidentally spilled beer on it at a show and scratched it up, and to my surprise, after wiping the bag clean, the beer didn’t leave any stains and there were no marks from the scratches. This leather is as durable as it is beautiful. [ JS ] Does your environment have any influence your line? If so, how? [ TR ] Environment definitely plays a role, it can be constricting or liberating, and you see it in the end result, in some way shape or form your environment translates into your work, and it can be a positive and a negative. I make it a point to stay curious, and to travel as often as possible, and to surround myself with the people, places and the things I love most. These aspects have always been a constant. [ JS ] While designing GC, you were also working a full-time job. How did you manage to juggle the two for so long? [ TR ] Bootstrapping is definitely tough, and as time goes on, you really start to feel like your creativity is being sucked dry. Your mind is never truly free from the woes of your day job even when you’re not physically there. I tried to keep a regular routine as much as possible, and made time for myself, such as working out, which became meditative and kept me grounded. I also have a good support network of friends that are also designers and makers, as well as the on-going encouragement from my husband and family members. [ JS ] What advice would you give to someone who’s looking to make the same leap as you? [ TR ] Make sure to have a good network of friends and family that will help support you and your vision. [ JS ] Now that you’re back in LA, what’s next for Georgette Crimson? [ TR ] Being in LA is about taking things to the next level and working with fellow creatives on collaborative projects. I’m also creating some new warm weather pieces, which will soon be available on my site. Additionally, I’m working on streamlining product launch dates, beefing up my ecommerce. I’m also planning a lookbook shoot and a Pop Up in June with the ladies from Edition 6, more details to come. Follow along @georgettecrimson and enjoy the ride. The ‘Little Black Bag’ by Georgette Crimson is available to order at georgettecrimson.com. LOCATION | The NEMA, James Turrell Skyspace and Kezar Stadium.